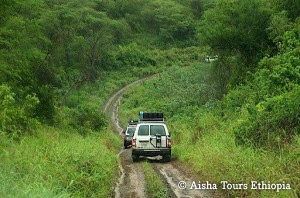 Mago National Park is located in southern Ethiopia and covers 2,162 km ². The heart of the park consists of savannah plains (450 m) and deserts that extend beyond the boundaries of the park to Lake Turkana. The vegetation consists of scrub, acacia savannah, figs and tamarinds from india throughout the river. Wildlife in the Mago National Park includes elephants, leopards, lions, buffalo, hartebeest and zebra and giraffes. Many bird populations as among other tenebrosus Turdoides. Rivers parks also full of crocodile, hippo and fish. Have the Mursi, Bodi, the Surma, the Nuer and Anuak who occupy these forest areas located in the hills west edge of the park.